I love the old dolls. At first it was just those from my own childhood from 1948 to 1956. Then I came to appreciate the dolls of my mother's time. Dolls are much more than toys or pretty ornaments. They tell a story about what it was like to live in their time. Their clothes show us fashion, their composition tell us about the technology, the construction certainly tells us that there was a time when children were taught to be careful with their toys. 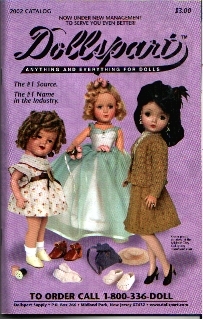 Today we see companies like Madame Alexander and Effanbee trying to recapture the charm of the old dolls using modern techniques. This really makes me appreciate the beautiful work of past generations and the importance of preserving and restoring these historic treasures. BULLETIN BOARD Just click a Picture for more information! 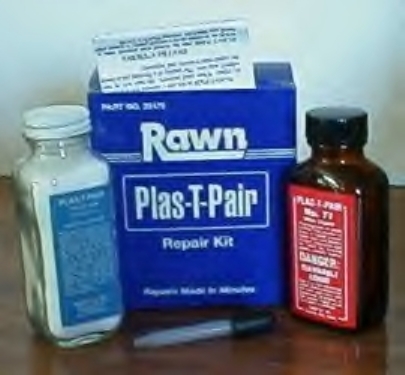 Mold this liquid plastic to replace broken doll parts! Great for broken Betsy McCall hip joints, shoe heels, cloning buttons,and other accessories. Don't order shoes by questionable sizes. like Toni P90 or 8" Betsy McCall. Hand crafted replicas of the originals! Under New Management! 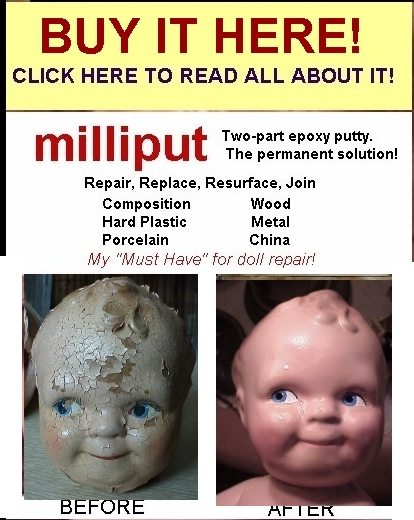 CLICK PICTURE to See Dollspart Supply's New Catalog! DEPARTMENTS Just Click on the Picture, Please! Pictures of our dolls. These photos might help you identify or put a value on one of your dolls or give you some ideas about a makeover for one of your treasured dolls. There's a new addition to the Alexander Gallery! Here's a shortcut to see my newest Cissy! Click here! If you have a doll you'd like to share, please email a picture with your name and a note telling me what you know about it to michele@otey.com Subject: "gallery". Here are some dolls whose identity is unknown. Perhaps a visitor will recognize one and solve a mystery. As above, if you have a mystery doll picture, please email it to michele@otey.com with subject "Mystery." 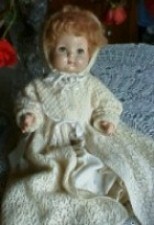 Occasionally people send me photos of dolls they'd like to sell. None of these are mine right now but I also use ebay and there's a link to any listings I might have up. Please look around the other pages and check back again. If there's a doll you're looking for, please email me. I might have one or know where you can get it.michele@otey.com with the subject "FOR SALE" and the display number of the doll you're interested in! Here's where you can order shoes to match your doll's outfits, hats, purses, dresses, undies, replacement buckles, wigs and lots of items to make your doll look as close as possible to the way she looks in the reference books! Most items that aren't vintage are hand-made replicas of items, listed by the dolls they belong to. So you won't need to know what size you need, just tell me what doll it's for and if we don't have it on hand, we'll make it! SOMETHING NEW IN THE NOTIONS DEPARTMENT. Reproductions of the hard-to-find Composition Shirley Temple Pinback Button. and Yes, I happily accept Pay Pal so you can use your credit card as well as a money order. Have a question? Ask and I'll try to find an answer! Just send email michele@otey.com to subject: "Question". In addition to the other tasks there's a new topic - restringing a compo doll. I'm working on getting more of the cord I used in this example, and will be offering it in the Boutique when I find it. Here are links to the schedules from the UFDC and McMaster's web sites. Is there a doll show or auction coming up in your area? Email michele@otey.com with a subject of "Happening" and I'll post it here. Be sure to tell me what, where, and when. A long time ago I learned we like "because" but we love "in spite of". Many of our dolls have imperfections that endear them to us, but if we could fix some of their problems ourselves, we would. Here, then are some of my secrets. Here are some links to some great sites that I've found very helpful. If you have some you'd like to see added here, email michele@otey.com Subject: LINKS. Over the years I've accumulated a virtual library of Doll books. The popularity of these dolls has resulted in many new books that picture these wonderful dolls. If you haven't been able to identify your doll or want to know its curent value, the best resources are books. Here's a link to Barnes and Noble that might help you find the books you need.